AWESOME, TRICENTENNIAL, NEW ORLEANS & FRENCH QUARTER INTRODUCTION! See New Orleans in the morning with a guided stroll through the French Quarter on this festive, 1.5-hour, historic walking tour. Enjoy the sites and sounds of the city, with insightful commentary given by the tour guide. Visit Rise and Shine New Orleans, plus the world-famous Cafe Du Monde, and more. Experience New Orleans in an early and unique way. Experience a memorable, 1.5-hour walking tour in one of the oldest communities in the United States: the historic Vieux Carr, better knows as the French Quarter, in New Orleans. Full experience approximately 2 hours. The tour begins at the St. Louis Cathedral steps at Jackson Square. 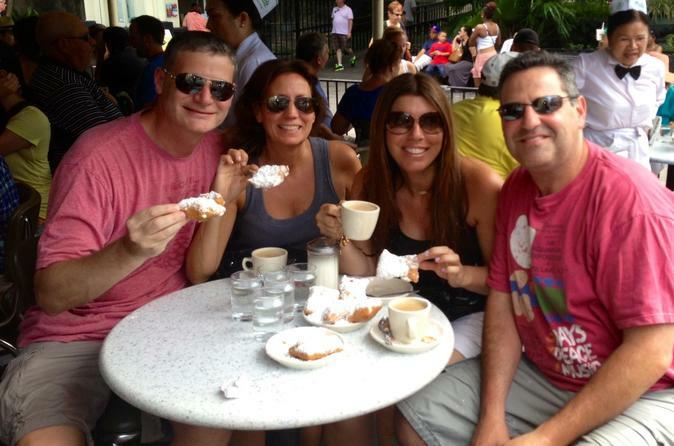 End with a delicious breakfast of beignets and cafe au lait at New Orleans’ own Cafe Du Monde. Next, travel through the Vieux Carré, the oldest sector of the city. Today, the French Quarter offers an exciting vision of the historic greatness of New Orleans with its narrow streets, French and Spanish architecture, and the oldest cathedral and apartment buildings in America. Courtyards, patios, intriguing alleys, artists, and musicians on every corner, outdoor markets, and a wide array of internationally famous restaurants make the French Quarter the heart of New Orleans.